After 2 years of assessment of the Clinch River (St. Paul, VA) and nearly a year of river cleanup concept discussions with the Friends of the Middle River (Staunton, VA), StreamSweepers has the green light to proceed with comprehensive cleanup in Partnership with a host of area conservation and social organizations and agencies. Fundraising and short range planning for our Clinch and Shenandoah Rivers Cleanup Campaigns is now underway. The Clinch River program will take several years and will be the largest industrial river cleanup in our history and comes on the heels of completion of our Rappahannock Rivers Cleanup Campaign (2012-2018) this year. If you would like to help, please contact the Center at 540-7672-2542. And, if you would like to donate to these efforts, please find our 2019 Campaign button on our website. Calm still water in areas with deep pools (even lily pads in a few spots). The weather is cooperating and we have moved over to the Mattaponi River in Caroline County. Assessments are nearly complete and trash removed from a four mile section has already been delivered to the collection site. The crew is patiently moving along the river in a section below the Milford DGIF boat launch which is littered with downed trees. We appreciate the assistance we’ve received from local government, Luck Stone and landowners who provided us with information and access. Look for another update early next week! A few items of trash in the first four miles: 5 tires, 4 bags of cans and bottles, and an old seat cushion, some siding and metal. 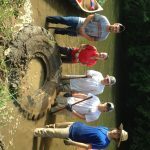 4 tires with rims plus a big tractor tire between Paige Road and Milford. Some pretty consistent navigation challenges with all of the wind and rain this summer. First day of river assessment leaving DGIF Boat Launch on Paige Road. Friends along the way, including great blue herons and a large bald eagle and lots of fish jumping.